These were a series of report for each parish produced by the local minister to outline the geography, population and activities of the parish. The Final and Third Statistical Account was produced in 1956 and printed below. by Rev. J. S. Mulch, BD. and Rev. P. F. McEwen, MA. Physical Basis. The parish of Glenbuchat runs west-north-west from the point where the Burn of Buchat joins the River Don, 40 miles from Aberdeen, to the ridge of mountains that divides the counties of Aberdeen and Banff. It is bounded on the east by Towie, on the south and south-west by Strathdon and by the Banffshire parishes of Cabrach on the north and Inveravon on the north—west. The parish is 71/4 miles long and from l1/4 to 31/2miles broad, and has an area of 11,089 acres, of which 1,500 acres are arable. History of Local Community. 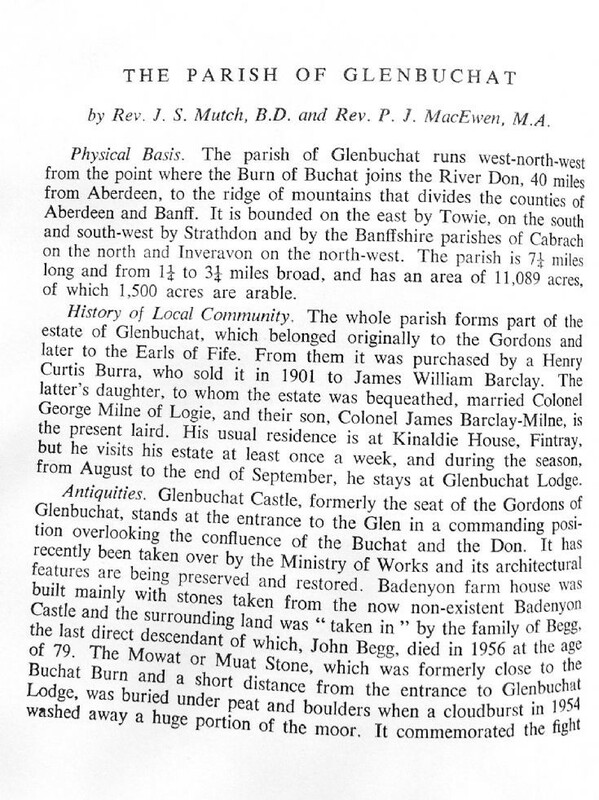 The whole parish forms part of the estate of Glenbuchat, which belonged originally to the Gordons and later to the Earls of Fife. From them it was purchased by a Henry Curtis Burra, who sold it in 1901 to James William Barclay. The latter’s daughter, to whom the estate was bequeathed, married Colonel Colonel George Milne of Logie,and their son, Colonel James Barclay-Milneis the present Laird. His usual residence is at Kinaldie House, Fintray, but he visits his estate at least once a week, and during the season, from August to the end of September, he stays at Glenbuchat Lodge. Antiquities. Glenbuchat Castle, formerly the seat of the Gordons of Glenbuchat, stands at the entrance to the Glen in a commanding position overlooking the confluence of the Buchat and the Don. It has recently been taken over by the Ministry of Works and its architectural features are being preserved and restored. Badenyon Farm House was built mainly with stones taken from the non-existent Badenyon Castle and the surrounding land was “taken in " by the family of Begg, the last descendant of which, John Begg died in 1956 at the age of 79. The Mowat or Muat Stone, which was formerly close to the Buchat burn and a short distance from the entrance to Glenbuchat Lodge, was buried under peat and boulders when a cloud bust in 1954 washed away a huge portion of the moor. It commemorated the fight to the death between Mowat of Abergeldie and Forbes of Druminoir for the lands of Brux and the heiress, Kate Cameron, whose husband had been treacherously slain by Mowat. The Garnet Rock, also known as the Clach Maddy or Wolf Stone, stands on the hill beyond Beltimb and people still climb to the spot to extract the garnet, which makes a very presentable brooch. On the Moss Road beyond Upperton is a cairn in memory of Alexander Davidson, a poacher well known from Braemar to Inverness, whose body was found on this spot. Originally a contractor in the Braemar district, he is said to have taken to poaching after he had been badly cheated by a laird in the Derry Lodge area. He was a man of commanding presence and a great dancer. The Davidsons of Craighead, Glenbuchat, are said to belong to the same family. Population and School. Since 1871, when it reached the highest recorded figure of 570, the population of the Glen has steadily declined. The figures are: (1901) 403; (1911) 340; (1921) 260; (1931) 222; (1951) 195. This decrease, seen in practically all rural areas, is due principally to the higher standards of living which, within the last half-century, country people have come to look for and expect, and which the small crofts cannot provide. With the result the crofts and small farms have disappeared gradually from the Glen and the houses have been either demolished or allowed to fall into ruin. Formerly there were three schools in the parish, at Balloch, Bowiebank and Dulax, but owing to the decline in population there is now only one primary school. At September 1955 this school had one teacher and 117 (see note below) pupils. At the age of 12 pupils transfer to the junior secondary school at Towie. Agriculture and other Occupations. The agricultural statistics at 4 June were: Tillage 566 acres; temporary grass 886 acres; permanent grass 355 acres; rough grazings; 9,786 acres for livestock, totals were: horses 22, dairy cattle 27:, beef cattle 510, sheep 2,992, pigs 130; poultry 6,136. Holdings over one acre numbered 33. Total tractors at 18 February 1954 numbered 17 and there were no electric motors. The farms now range from 50 to 200 acres arable with, in most cases, an out run for sheep. Farmers are meantime making a very good living, only one or two being without a tractor, while few are without a car. There has been a great increase in the number of poultry, the yearly output of eggs from the Glen now being about 62,000 dozen. There are three gamekeepers, all employed by the laird, and one estate joiner. Public Services. In 1949 the rail passenger service to Alford ceased but a goods traffic service still continues. There is a bus service to and from Aberdeen three times each day, the earliest departure from the Bridge of Buchat being 8 a.m. and the latest arrival 9.20 p.m. There are three local carriers and in addition local hiring is also carried on by James Davidson, who owns the one shop in the Glen. This shop also houses the sub-post office and has a petrol station attached. Mr. Davidson is registrar, session clerk, honorary secretary of the hall committee, and a J.P. Mr. George Tait is the present postman, has served the area for 31 years. HIS daily round on a bicycle is approximately 25 miles. He is a wide reader, well versed in the lore of Scotland in general and the Glen in particular, and is regarded among the parishioners as one of the Glen’s youngest ‘oracles’. The Glen is served by the doctor from Strathdon and a district Nurse who resides in Glenkindie. Until recently refuse was collected in dumps and then buried or burned, but now the County Council has begun a refuse collection which costs about £2 15s. a year for each house. Drainage for houses is by means of cess pits. The earliest form of lighting used in the parish was by the “fir stick," a sliver cut from the roots of trees in the old Caledonian Forest. These roots, which showed signs of having been burned at some remote time, were very resinous and gave a fairly steady light, and it was the custom for any poor man or elderly relative to hold the stick while the women were spinning. Later an iron holder was used, which became known as the ‘puir man.’ Cruises or pith lamps followed the “fir stick"; these were small iron holders filled with deer tallow or some other fat reduced to oil, in which the pith of local rashes or reeds was laid. Homemade candles succeeded the cruisie and older people can still remember this as one of the annual chores. To-day bottled gas is ousting the pressure oil lamp and electricity is increasing in popularity, although many in the parish consider it too expensive. It is in half a dozen farms, a few houses, and at the shop, from which a supply is extended to the church and on occasion to the Hall. The North of Scotland Hydro Electric Board’s scheme has reached Towie and may soon be in the parish. In addition to the public telephone in the shop, so far seven telephones have been installed in the parish. The houses are all fairly old but are in good repair. Indoor amenities are slowly increasing and the old heavy brown paint which for long seemed to be the standard for house interior decoration has now given place to bright and colourful designs. Curtains fresh and contemporary in style prove that the mail order catalogue finds its way into the glen, as well as the more frequent use of shopping in Aberdeen. The Church. The church in present use is the former Free Church, and the charge is at present linked up with Kildrummy, although this is a temporary measure. Union with the parish of Towie has been agreed to, when Towie next falls vacant. There are 115 Communicants of whom 25% are regular attenders, but about 80 per cent turn out to the twice yearly communions. Services in Glenbuchat Church are held from May to October at 10.30 a.m. and the rest of the year at 6.30 p.m. There are 12 pupils at the Sunday school and an active Women’s Guild with 15 members. A Christmas choir is easily raised, as there is a good tradition of singing in the Glen. As there are no other denominations, the church is part and parcel of the community. Younger people rarely attend in winter when the service is at 6.30 p.m., but it should be added that many who are employed in Aberdeen have to return there on Sunday evening. Joining the church is now a largely meaningless ceremony except as a passport to marriage and the baptism of children. There is however, a genuine regard for the church, as any family crisis amply proves, but financial support does not reflect the comparative prosperity of the members. In 1956 the former Parish Church manse was sold to Colonel J. Barclay- Milne for £500. When Glenbuchat and Towie are united, it has been agreed to sell both manses and to erect a new manse half-way between the parishes at Glenkindie. A part of the former Glenbuchat Manse steadings, which has been turned into a small Church hall, has been retained by the congregation. Leisure Activities. The Hall is the centre of social life in the Glen. It was erected in 1899 by local effort and at present money is being raised to install added facilities. In former days the three main events were the tradesmen’s ball, the farm servants’ ball and the farmers’ concert and dance. Wapinschaws and charity shoots, to help someone down on his luck with, say, the loss of a cow or a horse, are now things of the past. Concerts, whist drives, and the Women’s Rural Institute are the main interests, with dancing as the most popular. A badminton club functions in the winter and the nearest young farmers’ club is at Alford. Way of Life. Family life is still a real entity in the parish. Some boys remain on the farm, but most young people have to find employment outside the Glen, although practically all come home for the weekend. Mechanisation has lessened the need for a large labour force, but people are happier because they are released from the drudgery and wage slavery of other days. The Glen has a strong parish loyalty, the only cloud on the horizon being the future of the estate of Glenbuchat itself. If it is sold or broken up because of high taxation, many of the smaller farmers may not be able to buy their farms. But at present they are hardworking and contented and are conscious of having a fair heritage. Definitely not 117 pupils in 1956, 17 seems more like it.